No vintage bike should be without this! 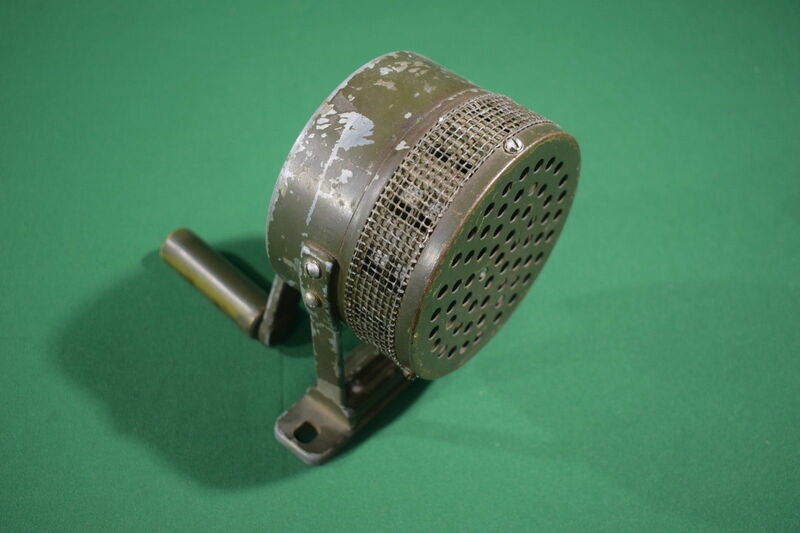 A working WWII hand crank air raid siren! Just add bar clamps and this unit rides proud atop your handlebar! No longer will you cringe at the charge of a bad dog or wonder what the distracted driver/cell phone zombie walker is going to do, you'll have their ATTENTION. If I could just incorporate it into my crankset, I'd be all over that. Man's best attempt at a mechanical primal scream. I have a couple airzounds in the stash, awaiting the proper moment. The problem with these kinds of things is that we can easily become trigger happy, causing more problems down the road. I used one regularly when riding in Merida. Most of my issues there were the kind one would deal with in the first world. Here in the village, though, the infractions are a simple matter of simple people who didn't grow up around motor vehicles, and still aren't familiar with fast bicycles or the fact that somebody else might want to use the road. It just doesn't cross their minds. In these cases, politeness is the best policy. seedsbelize what a wonderful place you live in, if only "politeness" would do. I now primarily just ride on the local bike trails, which thankfully are abundant 80+ miles, because the roads aren't even safe for cars these days. We were rear ended twice in one month, both times distracted drivers. Even on the trail when I pass through the urban section I have to be on high alert for the ear pod people (likely even this air raid siren couldn't be heard as when I pass I can hear the music), zombie cell phone walkers and others that seem to think there is no right of way on a trail, just "Their" way. Sigh, but at least they won't drive over me. Oh and enjoy your 88 Centurion Ironman Expert, I just got my 87 Centurion Ironman Expert they are beautiful bikes, will post my ride impression when the weather allows. attach it to a cable and lever on your handlebar and the siren song is just a finger flick away, every time. What is the spacing on the bracket? Maybe you could mount it to a water bottle boss and drive it off the inside crank ring. All I know from the ebay auction it's supposed to fit right on your WWII Willy's jeep. Obviously a parade and grand child magnet. Grandfather's mom's quake in fear LOL, no not really. Nowadays that would need to have a bluetooth transmitter, that would transmit to the headsets, smartphones and entertainment systems of all vehicles in a 20-meter radius. Drivers don't even respond to ambulance sirens anymore. Mount it near the bottom bracket, driven off the crank with some kind of mechanical throw out which is normally well, thrown out. When neaded you can engage for near instant sirenage. Very well said, and a good way to go about it. I used to time and score 5K's, 10K's, etc. For insurance and liability purposes, we always made it clear no earbuds or headphones allowed. A certain % always ignored that, often combined with covering up their runner's number, wearing it on the back, etc. No biggie. If the chip didn't work, they simply weren't timed or scored. When they complained, we smiled, pointed to the iPad showing them crossing the line, oblivious, and said "you must have been in the zone!" It worked a lot better than clubbing them to the ground like baby seals. There's also this as a cost cutting option to the WWII hundreds of dollars ebay siren, the tens of dollars Fire Chief siren. Comes with, GASP, actual written instructions with drawings. 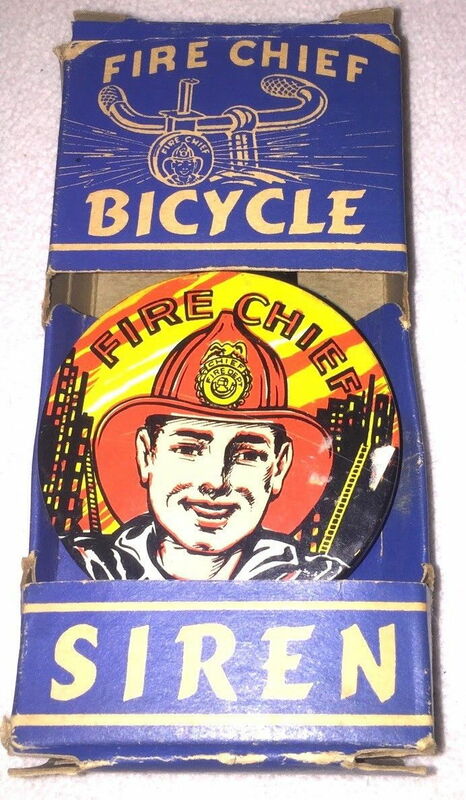 I've seen predecessors of the Fire Chief Bicycle Siren that date back to the very early 1900s. Another popular option in the early days of cycling was the tyre bell. 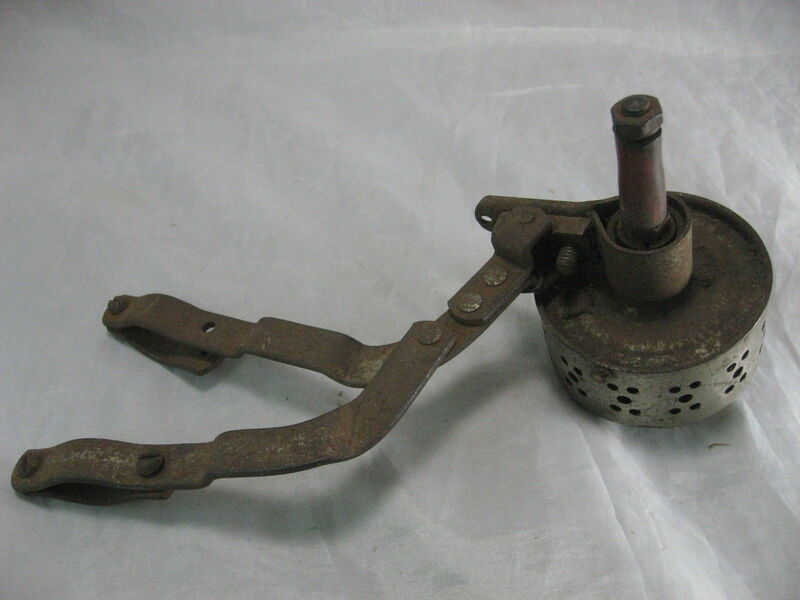 The bell was mounted on the fork or stays and pulling a string caused a as small wheel to contact the tyre, which activated the clapper. Unlike a handlebar bell, they could operate continuously, as long as the bicycle was rolling. They were also much louder, as they were typically bigger. I've seen examples as large as 4" in diameter. There were even some whistles that acted similar to the tire bell. 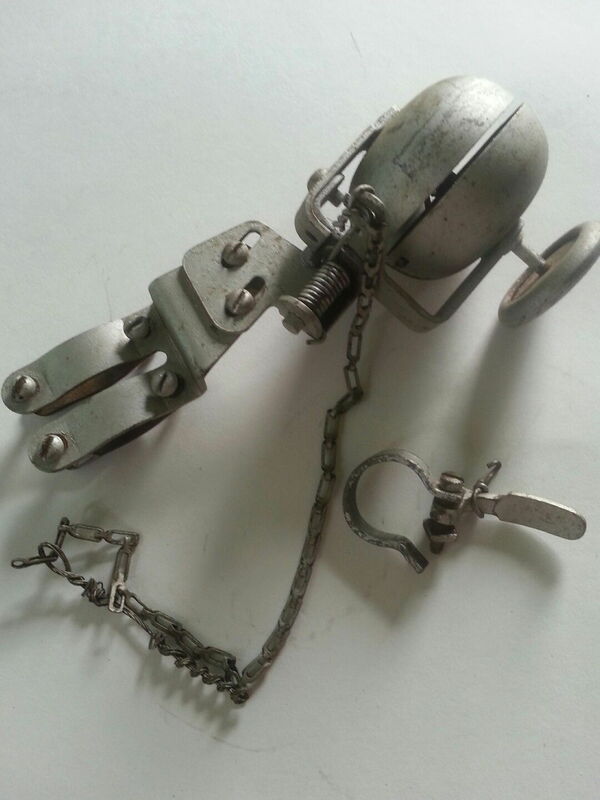 A string activated wheel would engage the tyre, which drove a small propeller that forced air through the whistle. I like this idea. 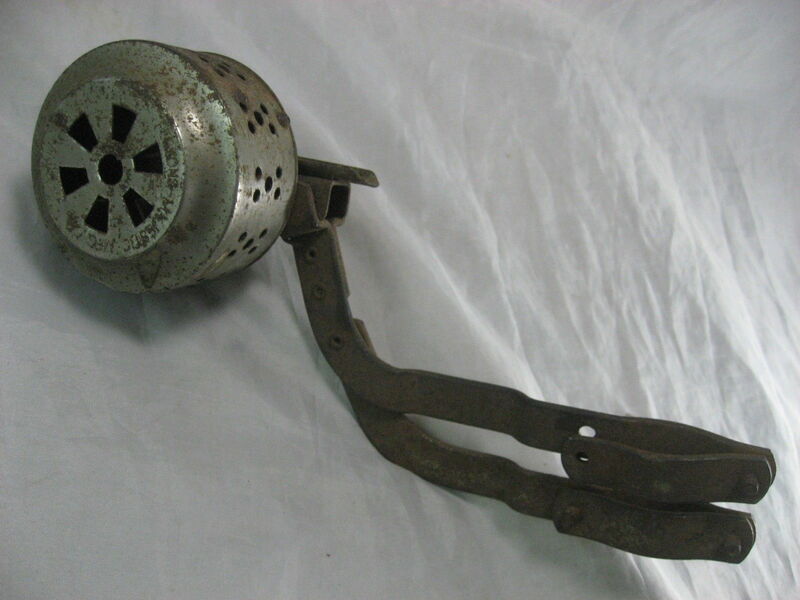 Sort of like a sidewall dynamo with a clutch only attached to a loud siren instead of a light. 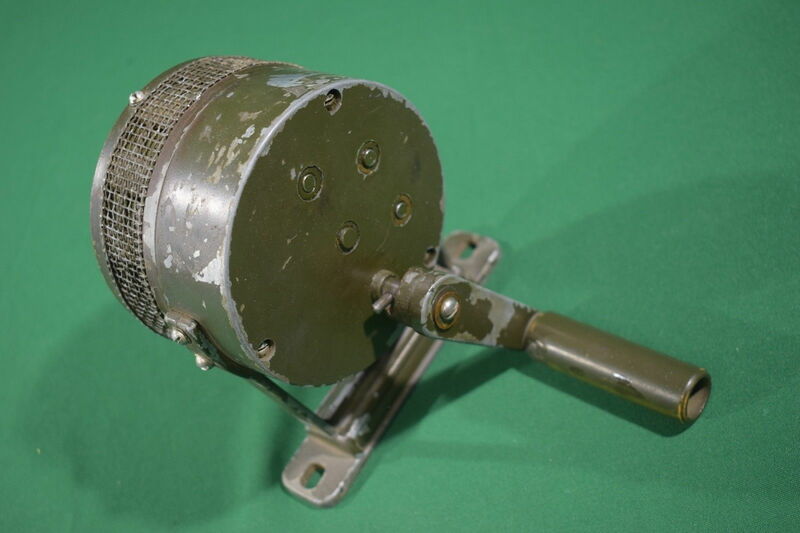 Here's an example of the wheel driven siren. available on the Bay. 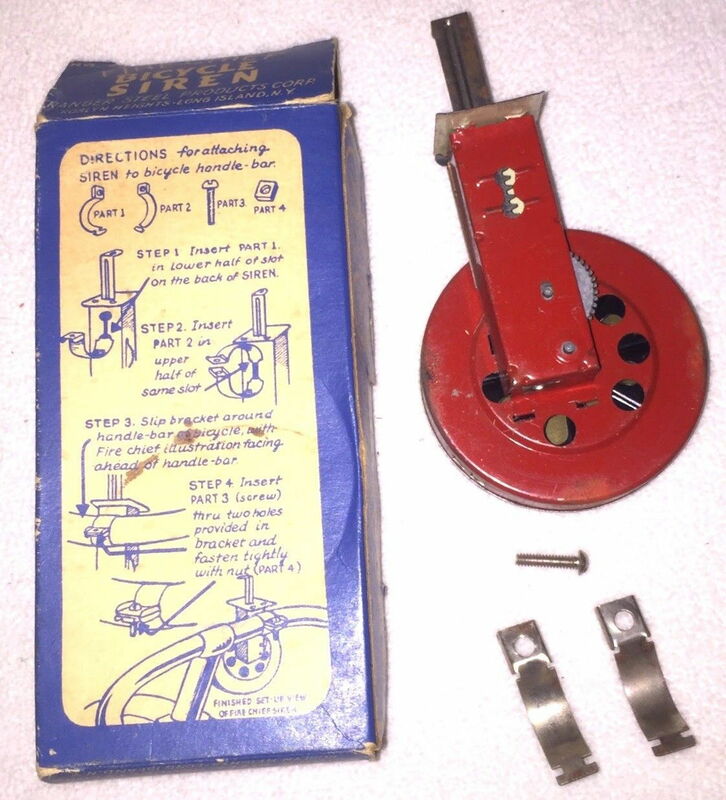 And here's the wheel driven bell, both made by Majestic who must have made a bunch of them as both popped up on random search on Ebay.Both made in the U.S.A.
Wow, think of both running at the same time! Maybe it would wake the Zombie Walkers from the dead? Now, if we had a disc wheels made out of metal, instead of carbon fire, we could all have 622mm gongs at our disposal. But I still contend that even the loudest device won't snap some of these zombies out of their trances. You need something that will blank their screen, or maybe send a mild shock into the frame of the device they're fiddling with / staring at. I find that if I "need" a very loud horn, it means I'm going too fast for conditions. It's not a good idea to get in a situation where I need someone to move very quickly. Because when that situation occurs, there is no assurance that they will, even if it's the rational thing to do. Funny you mention the issue of speed noglider, my other close calls on the trail have been due to other riders and in particular one kind of rider, Mr. Semi-Pro (at least in his own mind), and never Mrs. Semi-Pro. You are riding along in your lane, maybe 12, maybe 14 mph, enjoying a long ride when without a bell ring, an "On Your Left" no signal what so ever, Mr. Semi-Pro passes at 20-25 mph, and sure there's 4 + feet of trail he could use to pass you, but no, he passes just past the end of your handlebar. And no, never an apology, Mr. Semi-Pro doesn't care, it's all about his ride and someday it may be his accident that imposes enforced speed limits on the trails I love as they exists now in other communities, now how can we reach him? Last edited by since6; 12-06-18 at 05:57 PM. I find that an audible signaling device, whether on a bike or in a motor vehicle, is more often needed to get someone NOT to move, than to get them to move. Most often, people at stop signs in cross-streets, who don't understand that "STOP" means WAIT for the cross traffic to clear. In those cases, my speed is not a factor.